Based on high levels of infected Culex mosquitoes trapped in recent weeks, the City of Fort Collins and the Larimer County Health Department hope to decrease the risk of human West Nile virus infection by spraying for mosquitoes in sections of South Fort Collins and adjacent county areas. Please see the maps for the specific areas where the City and County have sprayed this season. There are no more sprays scheduled at this time. En esta página, usted encontrará consejos, recursos y boletines de publicación inmediata que le ayudara a mantenerse informado y protéjase. Protect Yourself with the Four D's! Drain: Mosquitoes breed in water! Drain any standing water in your yard each week. Bird baths, clogged gutters, and kiddie pools are common breeding sites. Dress: Wear lightweight, long-sleeved shirts and long pants while outdoors. Spray clothing with insect repellent since mosquitoes may bite through clothing. In addition to a recommendation by the Larimer County Department of Health, spraying will commence in any treatment zone where the vector index meets or exceeds 0.75. In order to best target infected mosquitoes, treatment zones are based on current data and are often different, smaller, or may cross quadrant boundaries. WNV vector index levels updated weekly. Trapping has ended for 2018. Last updated: September 27, 2018. Vector Index levels for quadrants are provided to alert the community to the threat of WNV in large areas of the city. Decisions on adult mosquito applications are made based on data from at least a 5 trap area. The City operates a network of 53 traps providing weekly data on the level of WNV in targeted areas. Interested in how the Vector Index is calculated? Find more information from the Centers of Disease Control here. Take a moment to sign up for community alerts for West Nile virus (WNV) spraying at Larimer Emergency Telephone Authority (LETA911). LETA911 is the Governing Authority for 9-1-1 in Larimer County Colorado. LETA911 provides oversight to 9-1-1, the equipment, and the programs funded by LETA. This includes non-emergency or community alerts for WNV adulticiding. 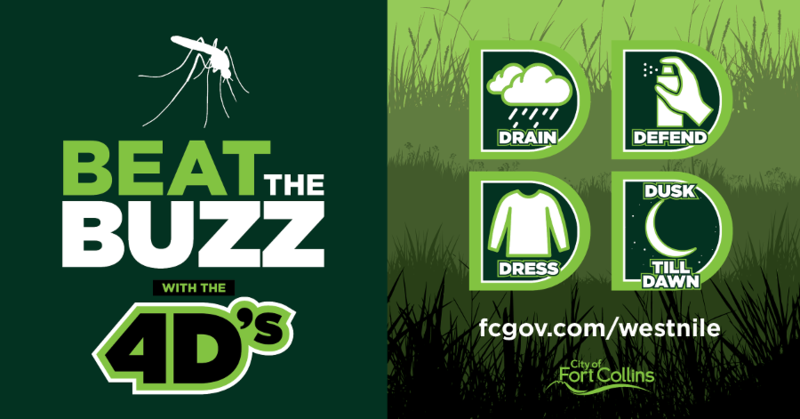 Create an account and under "My Alert Subscriptions" click "Community Alerts" and then check the "Fort Collins | Poudre Fire Authority" box and check "West Nile Virus Spraying" to receive alerts. Our mosquito control contractor, Vector Disease Control International, has a NEW interactive mosquito surveillance and control map. If you are a business or laboratory you can apply to opt out of our adulticiding (spraying operations). Please keep in mind only commercial businesses able to prove a long-term negative financial impact on their business will be considered. To apply, enter your business and contact information. Applicants will receive an application via email with the requirements and details of the opt-out. View the West Nile Virus Risk Map to understand where testing indicates the presence of West Nile virus positive mosquitoes. The City of Fort Collins operates 53 traps throughout the community to provide up to date information on the severity of West Nile virus. The West Nile Virus Technical Advisory Committee meets to discuss the previous mosquito season and considers recommendations for future response guidelines. The committee is composed of City-appointed experts who provide technical expertise and make recommendations to City Council regarding the City’s West Nile Virus Management Policy. Visit their webpage for meeting minutes and to get notifications when new minutes are available. Meetings are held from 4:30 - 6:00 PM in the Parks Department Conference Room, 413 S. Bryan Ave.